Cognitive Ink helped Discovery Shopping to create a revolutionary online shopping experience that captured the rich and enticing experience of window shopping. The goal of the project was to translate motivating elements of the real world experience into an online environment that promoted product discovery. Shopping in the real world continues to feel kinaesthetically rich, when compared to many online experiences. This is especially true when considering online stores that push products stripped of any significant experience, brand or product information, and in the process removing the visceral enjoyment associated with shopping. In contrast, a well-designed physical shopping precinct is a multi-sensory experience. The concept of discovery-based shopping extends from the richness of the offline shopping experience. Early themes included design elements like Google Streetview, as this was intended to capture the ‘offline, real world’ nature of shopping.However, online experiences that literally replicate the real world (like Google Streetview) provide too little bandwidth to communicate the literal feel of the street. Further analysis suggested that a shopping experience on either end of the spectrum is not ideal, from a site that is too close to the offline experience of shopping or conversely is totally abstracted away from any shopping experience. Later themes progressed towards a conceptual model that focused on the ‘flavours and tones’ of the offline experience, but provided the convenience and filtration power of the online environment. To understand what customers enjoyed about window shopping and what sparked their interest, we carried out a series of user-focused research activities. Taking the outcomes of these, we then ran internal workshops with the Discovery Shopping team, starting an iterative cycle of defining requirements, narrowing these down to design themes, and then providing the interaction design and architecture for the solution. Location awareness – The experience should use location as a key anchor point throughout the content. Much like news site provides section specific sub-branding; the location must ‘run through’ the site. Relevance levers – The user must have easy access to relevance controls in the form of a survey, navigational control or other technique, to ensure they can filter the relevant stores for likely relevance. Dopamine novelty – New information encourages the release of dopamine, which provides positive reinforcement for more information seeking activities. The site should encourage this novelty with new information, secondary journeys and imagery based content. Store context – Use of various contextual indicators that give the flavour of a store, including: style, colour, brand imagery etc. Large imagery - Promote and make use of large, eye-catching shop window imagery. Large images increase engagement by providing a larger field of view to the user. The real world window-shopping experience is fundamentally a visual activity, so the online environment must provide a visual experience. The most visible example of this type of image-focused design is Apple’s product pages. Window context – Although the online site should avoid skeuomorphism (representing physical artifacts in a virtual environment), there is value if providing a sense of context, an awareness that the user is looking into a sequence of shop windows. This could be as subtle as including the shop window frames into the product imagery. This will also help localise and providing separate identity for each of the shops. Avoid literal geographical imitations – A journey through an online environment is not identical to a geographical journey. Although we want to imitate the key elements of context associated with window-shopping, there may be little value in literally imitating the geographical arrangement of shops, or forcing the user to move across a map to move between shop windows. Elegant treatment – Window-shopping in the world’s most popular shopping districts in an intrinsically elegant experience. The treatment must emulate this prestige. Initial sketch concepts explored crucial positioning of the filter based navigation. 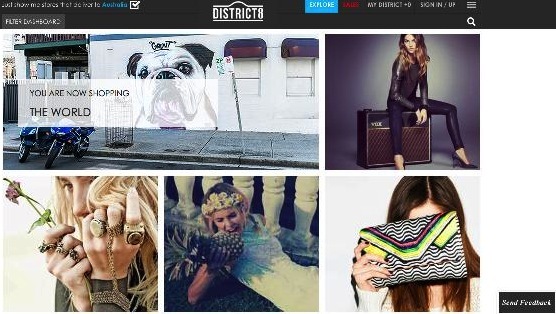 Search and filtration were a key value gained through District 8 being an online experience. Various concepts were explored to reflect the breadth associated with the various real-world shopping precincts for the home page, which was considered the initial key entry point. Later concepts focused on methods of exposing large scale imagery that evoked the detail of a precinct. The Discovery Shopping team launched District 8 in 2013.